Click Here to see all of the tools and equipment we use. Disclaimer: some of the links below are affiliate links, which means we earn a commission if you purchase something after clicking the link. As always, we only recommend products and services that we trust. First of all , I wanted to share a really great resource with you that I think would be super helpful for many of you. 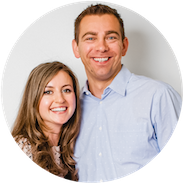 Food Blogger Pro is a membership-based website so you have the option of a monthly membership or yearly membership. It will take your blog to the next level and that’s why I’m so excited to share it with you! 1. 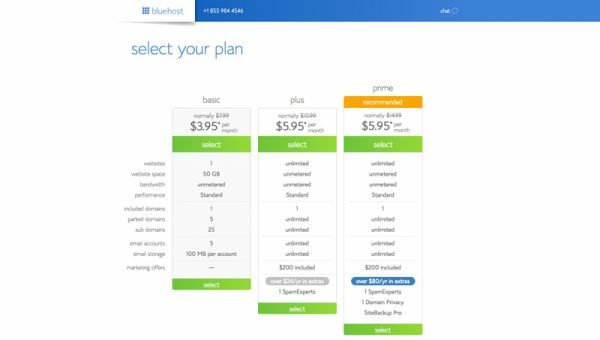 The two biggest factors to consider when choosing a hosting company are: reputation and customer service. 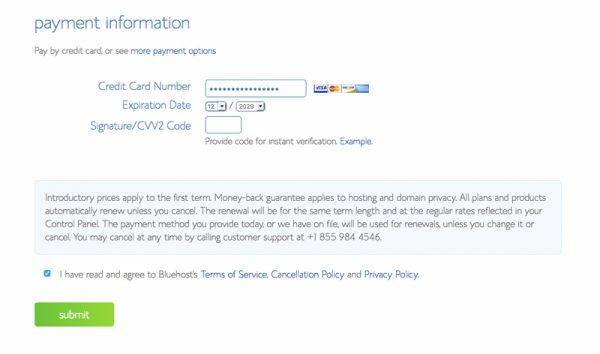 We recommend Bluehost and signing up is easy peasy. If you’re just starting out, I suggest the least expensive plan and upgrading over time as your blog grows. 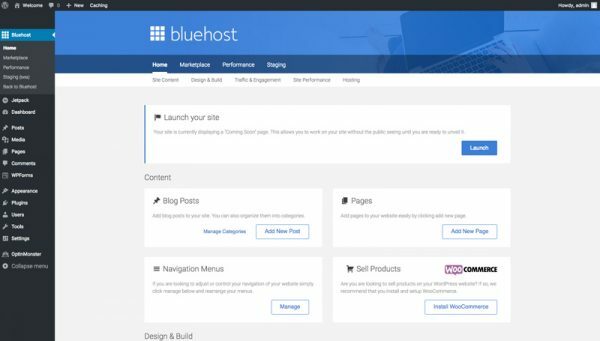 Bluehost is a well-known and reputable hosting company that has been in business a loooong time. It’s also hugely beneficial to be able to talk to a live person 24-7 if you need help. 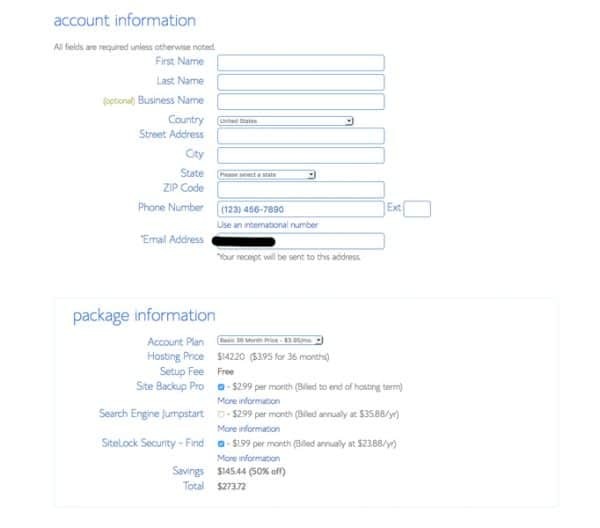 Their hosting package also includes a free domain name and there is no setup fee. If you are serious about your blog, take some time to brainstorm a domain name. Pick something that is catchy, relevant and easy to remember. Run your ideas by your closest friends or fam and get feedback. I think my sister Alla gave me the idea for NatashasKitchen.com! 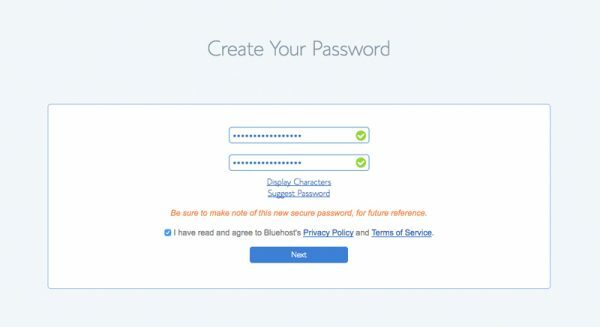 Head on over to bluehost and plug in your ideas. This part is fun and you can stake your claim on your unique domain name asap! 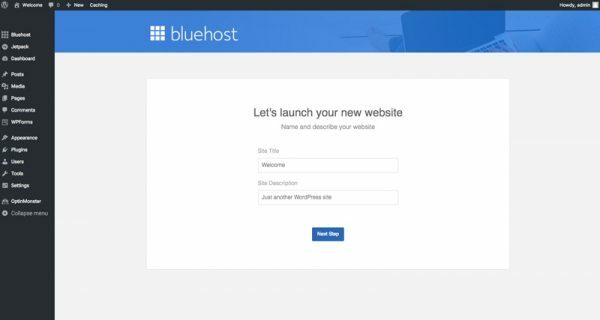 After you’ve signed up with Bluehost, you will need to install WordPress (a blogging software). We have used Wordpress from the birth of our blog and love it because of it’s simplicity; it’s very user friendly and installation is a breeze. 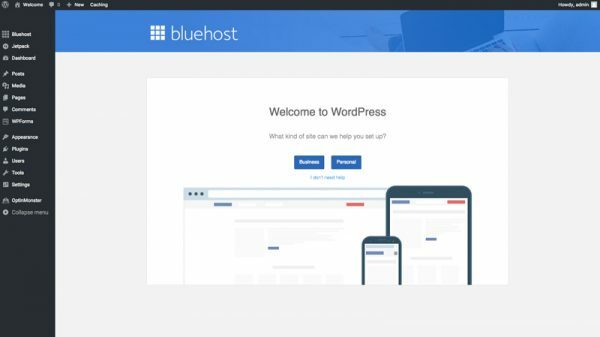 After choosing a theme that works for you, click on “Start Building” to install WordPress. You’re there. You’re officially a blogga. Congrats!! Thesis Theme for WordPress – We started out with Thesis and used it for about 2 years. Genesis is very popular Theme as well. 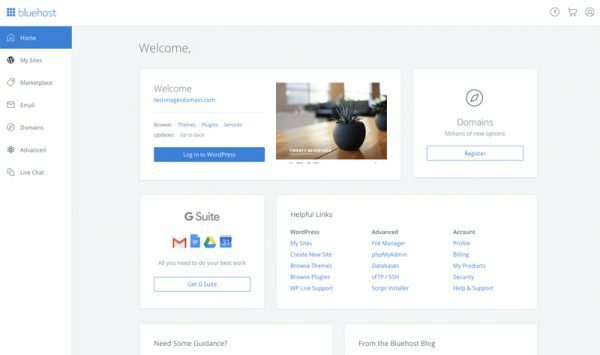 Free Themes for WordPress – WordPress has tons of free themes available if you’re not ready for purchasing a “premium” theme right away. 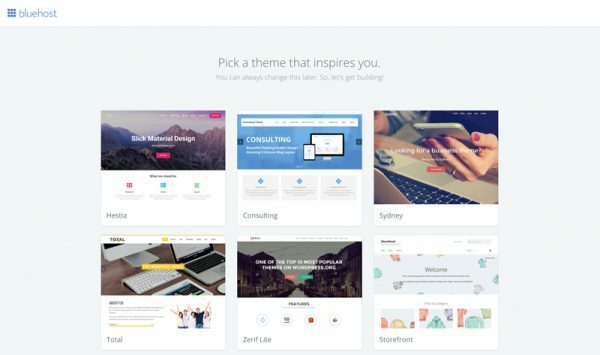 Start with one of the free themes without spending a lot of money right off the bat. Please do some research and check the theme’s rating before downloading and install it onto your blog. Avoid themes with three stars or less. If you’re serious about your blog and want it to be a full time career, invest in a custom web design. Cre8d redesigned our blog in August 2015 and it was blog changing! Their communication and work is fantastic. I wouldn’t hesitate to recommend them; worth every penny. If you get a quote from them, let them know I sent you by using my referral code: NK. When you’re first starting out, if you decide to place ads on your site, they will help to cover costs. As your blog grows with time, dedication and hard work, it is possible to create a full time income from blogging. The primary ad network we work with is Adthrive. Thanks for the shoutout in this super helpful post, Natasha! This probably is not the correct place for me to post this but since I watched your great video on how to make Artisan bread I have made/baked at least 20 loaves. I have searched all all over trying to find the little flour duster/sifter you use in the video..Could you tell me where you found it? I’d love to have one..
Love you blog and have for a long time. Hey Natasha! I was thinking of starting a food blog because I love cooking and sharing recipies 🙂 but a lot of the recipies I share are from “all recipies” which is where individuals share their recipes, sometimes I look at a couple of top rated recipies and blend them together into 1, is that considered copying? I guess the big question is are you allowed to use recipies that you did not create on your own from scratch? I do have one question, If you had to start your food blog all over (from scratch) where would you focus all of your marketing efforts? Pinterest, Facebook, Instagram, etc? I was wondering how you watermarked your photos? It looks almost transparent, but isn’t….if that makes sense. Hi Natasha! I’ve been toying with the idea of starting my own food blog and I have to admit it’s pretty overwhelming. One of the things I’ve been wondering about is how often do you post recipes when you just starting out? I got it, thank you! #36 — up two places! #25 as of May 14th! LOOK! I love your recipes!!! However, the slow cooker stroganoff recipe (as if would print) has an error in the ingredients. It is only listing the beef. I hope that you will correct this since it is a delicious recipe. I want to print it off and keep it. Hi. I just found out about your blog. I read that you live in Idaho. And you are from Ukraine. I was so excited. Because I am from Ukraine. I was adopted when I was 10. 8 years ago. I also lived in Idaho for almost 3 years. I and my family moved from there 2 years ago. To South America. I wondered where you live in Idaho? I have been a regular visitor to your website. I looked into this resource regarding food blogging and I have some questions. Could you please private message me to my email? Hi, Natasha, thank you so much for your blog. I recently have become a stay-at-home mom and have beeb rediscovering my culinary skills and joy of cooking for my family. Your blog is one of my greatest recipe sources! Since now i’ve been cooking often enough I can justify buying a Kitchen-aid mixer (before i didn’t see a point of paying $400 for an item i rarely use) and I saw you had a link to the similar one you own, but can’t find that link anymore. There used to be a link to all the items that you recommend, but I can’t find that either. 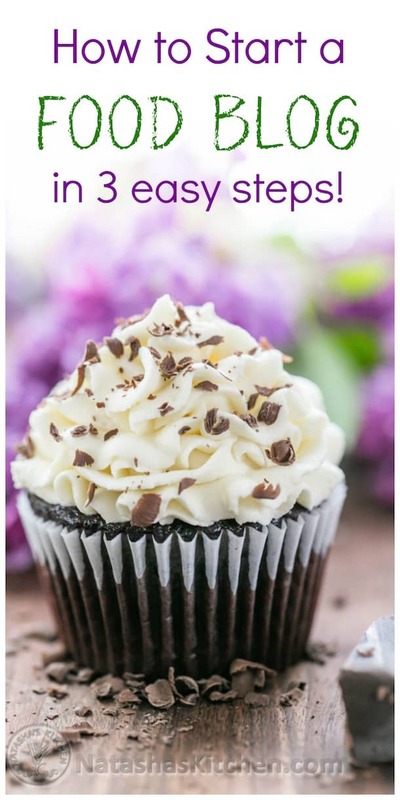 Thanks for sharing on how to start a food blog :). 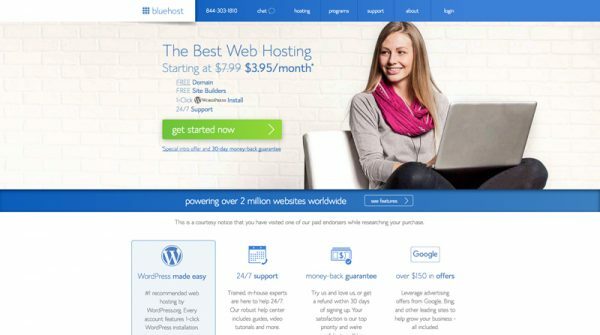 Noticed that you need to pay the webhost for the blog. I remember there is free blog offered by google website. May i know whats the difference between this paid blog and unpaid blog? Just found your site by googling “chocolate cherry cake” I’m going to make drunken cherry brownies today and wanted to see if there was a recipe I could use to mingle w/recipe I plan on using. Anyway, I found your page on starting your own blog too and I’m delighted and moved by your generosity and affection for your readers. I love your site. I am just getting started and my focus is lower calorie home cooking. Would love for you to take a look. I am from Idaho originally and reside in the Spokane area. Hope to continue conversations. Hi, Thank You very much foe sharing this information to start a blog.My daughter wants to start a blog. Hi Natasha! Great info! Thank you! The only question I have is what is that little sticker on all your pictures? The one with your website name? Is it more of a copyright thing? And how did you make one? Is it photoshop’d in all your pictures from the original? Thanks! Your blog is so good and the info you provided here is also very helpful as I’m in process of creating my own blog. Thank you for the inspiration! Natasha, I am struggling to find a retailer to purchase the actual wafers for making layered waffle wafer cookies – I live in MB and am accustomed to ordering items online, but am having no luck – can you help me with a resource for this. Love your recipes. Hi Natasha!!! My friend recommended your site, and I realy like it. but I have question, do you have recipes in russian language, I wanna recommended your site in Ukraine. I am about to try your recipe for the potatoe pancakes. My potatoes are a little soft, can I still use them.? I took the buds off. thanks, my mother used to make them. I always wondered how you get Russian text to show up on your blog. Is that a feature of Thesis theme or a plugin or something else? Your photos are great, your website is accessible, your ads are decent. I started my website with a private domain, also through godaddy, hosted by a personal friend in the biz so really I have not a single worry lol. Many of my pictures and gallery are comprised of old pictures of past recipes from bad quality cameras, I hope to eventually redo all those recipes but gosh it takes time! I edit my photos in Picasa, export my collages and resize in one swift motion as I export out. Yep, wordpress has a very low limit for photos when uploading! I learned it from my first post and got the ball rolling on the resizing right away. One question; how do you track your visitors’ comings and goings? Is it a plugin? I don’t want it as a “counter” on the webpage. Our website is http://www.a-mothers-treasure.com and our grand opening was Nov. 19, just earlier this week 🙂 We have big plans ahead! Hi Natasha, Here is a lots of a good info about blogging, and I got some ideas about it. But I’m absolutly new in this field and still have a lot of questions. What would you suggest to me? Maybe books, links or video, some kind of step by step instractions? Thank you Natasha for information and being so kind to me. Question – how do you place ad’s on your website? Do you contact them or they contact you?